During the 1970s, and through the mid-1980s, the University of Michigan Gilbert and Sullivan Society (UMGASS) issued most of its performances on LP records, and later cassettes. The original recordings are not in the scope of this website, as they generally were purchased only by cast members and local fans. However, Sounds on CD has started to issue select UMGASS performances of interest on CD, of which this is the first. UMGASS records were usually transcriptions of stage performances. As this was UMGASS's first production of The Grand Duke, and there was no professional recording in the catalog (the D'Oyly Carte's being three years away), the company decided to record this production in the studio. The sessions were soon after the stage production closed, so the performers were still fresh in their roles. The recording session also restored material that had been cut on stage. This recording enjoyed somewhat wider circulation than most by UMGASS, because of the novelty of a new LP of an opera that was then rarely performed. Indeed, like Katisha's right heel, it was "much admired by conoisseurs" long before Chris Webster re-issued it on CD. During my work on this transfer I received the tragic news that Stephen Poulos, heard here as Ludwig, lost his life in the shocking events in New York on September 11th, 2001. I am therefore respectfully dedicating this CD issue to his memory and have decided that a donation from each sale will be made to an appropriate charity of his widow, Lisa's, choice. The recording is magnificently conducted by Eric Stern who is now a well known conductor on Broadway. To quote from [director] Jim Drew's notes, "Everyone connected with this production accepted it as an established fact that Eric Stern was a certified genius. Subsequent history has proven the accuracy of this assessment. Eric's work as a Broadway conductor has placed him in the forefront of his profession. Every tempo in this recording has the feel of being the one exactly right for the moment. ... the amazing control of dynamics in the concerted numbers can leave one breathless." There is the occasional slip but these are infrequent and quite often are hardly even noticeable. All in all this really is a very fine recording of a very under-rated Savoy Opera which has had all too few recordings, and it deserves a place in every G&S collectors CD collection. There are very few cuts and the total running time is over 145 minutes. As to recordings, without a doubt the best recording of the Grand Duke IMHO is (drum role) UMGASS!! It is so musically precise and sung to perfection. Bravo! Bravo! American accents in G&S do usually jar with me but none did in this recording, in fact I could almost believe that I was listening to an English professional company. Eric Stern's interpretation of the score is pure delight with many fine touches, and the excellent cast give the opera a new lease of life. In my opinion a much superior performance than the 1976 D'Oyly Carte recording and certainly deserves a much wider audience. 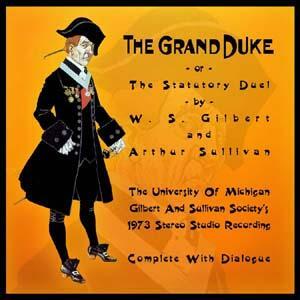 Jim Drew directed The University of Michigan Gilbert and Sullivan Society in its first production of The Grand Duke in 1973. A wonderful studio recording was made that included all the songs, some of the first night dialogue, and a few cuts to the first act finale ( but very few). ... It is a quintessential production of the work. It is the recording that made me fall in love with the show, and has one of the best "mad scenes" ever. The Michigan Grand Duke is the best recording of the opera I have ever heard. I knew it previously only from a rather scratchy reel-to-reel tape, so it is good to hear it now the glorious Webster technicolour (or is it technicolor?). It was particularly moving to hear such a fine performance from the late Stephen Poulos. Chris has done a superb job in preparing this recording. Get it!